Is RSL Art Union a Scam or Legit? Read 15 Reviews! The clock is ticking on getting in on the RSL Art Union Lottery. This is one of those delightful raffles that gives you a chance to win some amazing prizes. It was set up to help veterans in Australia. Players get a chance to win apartments, apartment complexes and gold bullion. There are a bunch of draws each year and get in on the VIP club and you can make sure you don’t miss one draw. The clock is ticking though if you want to get into the VIP stuff. 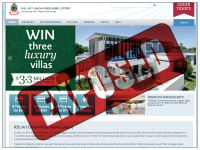 Want to win not one, not two, but three apartments in Australia plus AUD 2,000 to take that flight to get your prize? RSL Art Union’s 1st prize includes that plus enough additional money to pay your taxes for the first year. There is also a 2nd prize of gold to the tune of $10,000 and 3rd prize of $5,000. Tickets start at $5 though bundling is available with 8/$30, 13/$50 and 19/$75. Several draws occur each year with the close of the next on the 10th of March. Okay the odds are not that great compared to some of the other lotteries/raffles sold internationally to support charities. In RSLArtUnion.com.au’s latest raffles, there are 2,340,000 tickets available. Get into the draw by the 23rd of February and you’re in for an AUD 500 Red Balloon Voucher, automatic entry in all art union draws. Get into the VIP Club any time and you have the chance to win two $10,000 gold bullion bonus draws. Getting into the VIP Club is simple. Simply register and agree that they can direct debit you for each draw as they become available. Ever thought about owning an entire apartment complex? Once a year, RSL Art Union has its biggest giveaway. 1st prize is an apartment building with an estimate value over AUD 4 million. You can live in it, rent out the other apartments for the income or sell it tax free for Australians. People who reside in other countries might have to pay tax there. This raffle is open to anyone living anywhere. Part of the jackpot prize includes AUD 2,000 to get there to claim it. Of course, you are responsible for any visas needed, plus you might have to pay tax on your prize where you are from. For Aussies, this raffle is tax free. RSLArtUnion.com.au was set up to help current and ex-military people and their families for advocacy and welfare services, financial support, rehabilitation services and crisis accommodation. If you have any questions about this raffle, office hours are Monday to Friday 8:00 am to 7:00 pm (Australian Eastern Standard Time) and Saturday 8:00 am to 4:00 pm. There is a snail mail address, phone numbers for Aussie, New Zealand and International and an online form. They answer questions on a timely basis by email. The concept of helping a good cause and potentially getting to win property in Australia is nice. Okay, I’d settle for the 2nd prize of the gold bullion, but the only way I’m going to get a chance to win is to play. The VIP Club means you don’t have to check on when the next draw is and are automatically entered. This lottery gets a thumb’s up though it would be nice if the amount of raffle tickets for each draw was more limited. Then again, ultimately this is to help veterans. I agreed to what I thought was a payment of $30 for one draw and gave my credit card details. Only when given a brochure did I realise I’d signed up for regular $30 payments. I found the selling method downright deceptive. My interactions with the RSLArtUnion were a disgrace. I suspect it close to a Scam. They could not tell me how much money goes to the RSL. As such I am surprised the RSL allows its badge or brand to be associated with this organisation. It seemed to be a method to get my credit card details and then make it as difficult as possible to stop them taking more money from my credit card account. All the prizes are now looking the same as past prize draws I’ve been in as a VIP. The pictures are certainly starting to look familiar. It’s pretty sad if this lotto is a scam! Maybe a Current Affair or 60 Minutes needs to look into them to either expose them or prove they are legit. I know other people buying VIP tickets too so I have started mentioning it to others I know but so many people like me have probably been buying for years! This is the first time I have compared the ticket numbers so I don’t know if this has happened before, but a friend also had this happen to him. Needless to say, I feel very disturbed to say the least. This organisation is a joke when it comes to public relations. Absolutely disgraceful, RSL has debited my account 3 times in one day and told me it was unfortunate – FOR WHO! They are not to be trusted with credit card details and NEVER AGAIN for mine. I will incur bank charges due to direct debits not been covered. The response was unprofessional and obviously experienced by other subscribers. The people I feel most sorry for are the people they pretend to represent which is totally aporonate – this needs to be exposed which I intend to do. They have taken three payments off my credit card for one transaction and I have been told I am unlikely to receive my money back as the drawer has closed. They never return phone calls or reply if you contact them their website. They fraudulently take your money. RSL dishonest people. Don’t inform customers of ongoing payments and what VIP means. Do your sums. 2 million tickets sold in most draws, tickets $5 each. Where is all the money going? Wages, directors, staff, it doesn’t add up. Board members paying themselves money their not entitled to. No volunteers, all staff paid. I did not agree to continue to have my account debited by $10.00 each month. Please immediately credit my account or I intend to advise the NCAC of this unauthorised monthly debit. Scam. Do not support ever. They will continue to steal money from you after you “cancel” your subscription. Certainly a scam. I agreed to go into 3 draws, and then found they were taking $50 a month from my account ongoing. When I discovered this and contacted them direct (overseas contact centre) they promptly agreed to refund the ongoing deductions. Obviously I am not the only person to be scammed this way, the telemarketer would be unlikely to have caved in that quickly without going to a line manager, they would have been trained to handle calls like mine expediently. This is run by a third party with hardly any of the purchase price of tickets going to the RSL designed to make owners of third party very rich by using desparate people to sell tickets in Shopping centres and paying them a very small commission it is time this sort of operation was banned for ever. The RSL is a very worthy cause but much better to call and donate. I was not informed at the time of purchase that I was giving permission for regular payments. I felt that this raffle purchase was portrayed dishonestly. I have had a prompt apology to my complaint today and a promise of a refund of the 2nd, unanticipated deduction. Complete scam, only VIP win. Numbers allocated are not to what are drawn.